Description: A concave mirror is used to project a real image of a light bulb onto an empty socket. Empty glass frames can be setup to help students position their heads. Just have them look though the glasses. There are many different ways of going about this demo. Listed here are the two most common. Turn on the light. Position it so the mirros is not facing the class. Ask students if they can see the light bulb in the empty socket. They can't because there is no light bulb in the socket. Turn off the room lights. Now turn it so the mirror faces the class. You may have to move it slowly around the room so everyone can see it. The students now see the image of a light bulb in the light socket. With the light bulb in the light socket, turn on the apparatus. Cover the mirro with the black cloth, but leave it so the light bulb on top stay illuminated. Show students that the top light bulb is lit. Take out the light, making sure to cover it with either your hand or body (so they don't see it never went off). You can say something cleaver here. Wet your finger and stick it in the top light socket. You can make a scream or something to give the kids a scare. 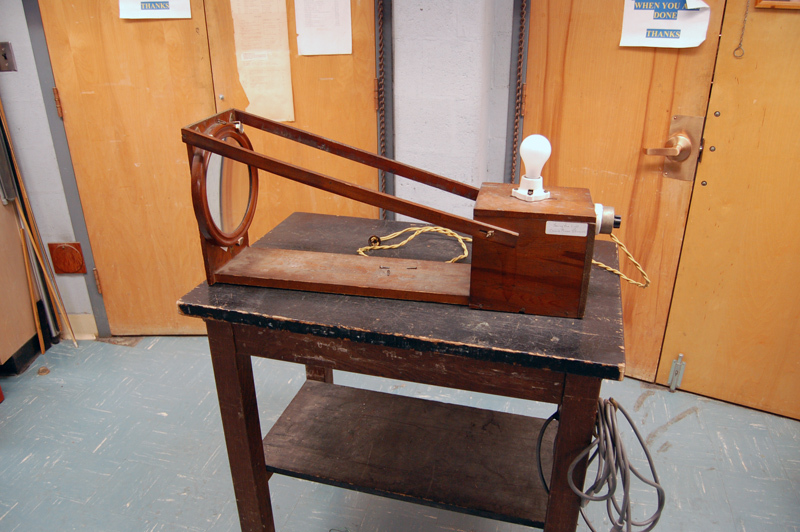 When finished, show the students the apparatus and the image of the light bulb in the empty socket. Note: If necessary, adjust mirror angle and bulb location to get the real image to sit in the empty socket.